Please contact us at (716) 763-2947 to purchase. Mike Sperry is a NYSDEC Licensed Guide who has been fishing the waters of Chautauqua Lake for over 30 years. Mike offers guided fishing trips for muskellunge, walleye, bass and panfish. His specialty is casting for muskies. Mike is the founder and past president of the Chautauqua Lake Musky Hunters from 2002-2007. 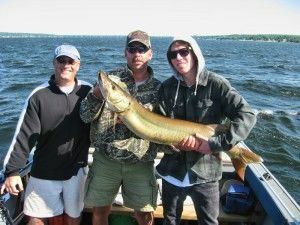 Mike has also fished with Pete Maina during the filming of the television show called The Next Bite while filming the episode entitled Chautauqua Muskies Unleashed. I was born and raised in the Lakewood, NY area and have fished Chautauqua Lake since the mid 1970’s. As a child, I lived very close to the lake, therefore, it has always been a big part of my life. At the age of 9, I caught my very first musky and was hooked on fishing for the elusive lunge ever since! I am determined to work hard to make your day on the water enjoyable and memorable, regardless of what we are fishing for – musky, walleye, bass or panfish. When I am not on the water fishing, you can find me back in the shop working on own lure collection known as “Smiling Jack Lures”. All my lures are custom, handmade and tested right here on Chautauqua Lake. They have been proven successful time and time again. 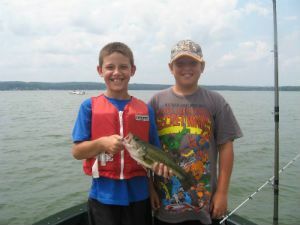 Our guiding service is priced right and offers the one of the best values to be found on Chautauqua Lake. So if you are looking for a combination of value and over 30 years of experience, then lets get in touch today! We specialize in Musky, Walleye, Largemouth and Smallmouth Bass as well as Crappie and other panfish on Chautauqua Lake. Shop Our Online Tackle Store Now!! !